Nils recently gave a talk titled “Deep Learning Beyond Cats and Dogs” at a TEDx event organized at the Technical University of Munich. Abstract: Deep learning, which is seemingly everywhere these days, is well-known for its capability to recognize cats and dogs in internet images, but it can and should be used for other things too. It can be used to figure out the complicated physics that dictate fluid behavior. Actually, simulating turbulence is not only a million dollar problem (really, google it!) but it can help us create more realistic virtual worlds. It can even help us understand medical and physiological behaviors like blood flowing through our body. Nils performs cutting-edge research and explains how neural networks are well on their way to becoming the fourth pillar of science. Biography: Nils Thuerey’s work is in the field of computer graphics: he models physical behaviors of fluids such as water and smoke to enable computer created virtual effects to look like the real thing. These phenomena are very expensive to simulate computationally, so Nils’ research explores the use of deep learning methods to generate the effects more quickly and more realistically. Before assuming his assistant professor position at TUM, Nils studied in Erlangen, held a post-doc position in Zurich, and worked in the visual effects industry. He was awarded a technical Oscar for the development of an algorithm which aids in editing explosion and smoke effects for film. This talk was given at a TEDx event using the TED conference format but independently organized by a local community. Learn more at https://www.ted.com/tedx , or visit the TEDxTUM website. There are admittedly still some rough edges, but mantaflow should give Blender users a significant step forward in terms of visual quality and performance. We just completed the Ferienakademie 2017 course on Neural Networks for Fluid Simulations. 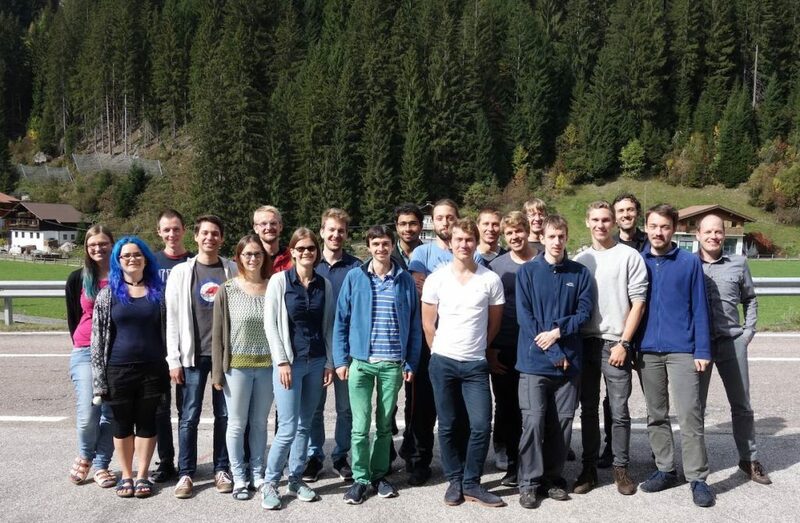 In total, 17 participants prepared short presentations about research highlights, and then worked hard on an own implementation of various generative neural networks for two dimensional fluid flow. This course was jointly organized by Nils Thuerey (TUM), Michael Engel (FAU), and Miriam Mehl (Universitaet Stuttgart). As part of the course, the participants were able to gain first-hand experience with deep learning algorithms, and explore connecting these algorithms with problems from the area of physical simulations. We used the tensorflow framework (https://www.tensorflow.org) for the deep learning part, and our own mantaflow solver (http://www.mantaflow.com) for the Navier-Stokes simulations. You can now find a second mantaflow-tensorflow tutorial on our webpage. It explains the example0 code of mantaflow, which represents an example that’s as simple as possible: a very simple mantaflow scene that generates some flow data, and a simple tensorflow setup that trains a simple neural network with this data. Despite its simplicity, it contains all the important parts: data wrangling, network training, and result generation. Also, it’ll demonstrate how much you can get out of a fifty-dimensional latent space from a simple NN auto encoder. Curious how these weird wisps of smoke were created? Check out the full tutorial here..
Sebastian Barschkis, a TUM computer science student, just successfully finished his Google summer-of-code project, pushing the integration of our fluid solver mantaflow into the open-source animation package blender (https://www.blender.org) a step further. In his project, the main goals were a secondary particle extension (for splash & foam particles of liquids) and the integration of our primal-dual guiding optimization (see the full paper here). Hopefully, that moves us yet another step closer to releasing mantaflow as part of an official blender release, 2.8 hopefully! We’ve just posted a first introduction in a series on how to couple mantaflow and fluid sims with tensorflow and deep learning algorithms. The latest release (v0.11) of mantaflow comes with a set of data-transfer functions to exchange data between the two frameworks, and provides three examples with varying complexity. The page below gives an introduction to mantaflow-tensorflow coupling, and an overview of the data transfer functions. A more in-depth discussions of the three coupling examples will follow in the next weeks. The two papers presented here focus on data-driven fluid simulations and simulation algorithms powered by deep learning. The latter proposes a method to match pre-computed space-time patches of flow data using a convolutional neural network. This network can robustly establish correspondences between new simulations and the pre-computed entries in the repository. In particular, the network learns to take into account the effects of numerical viscosity, which are otherwise extremely difficult to predict. This is a good example of how deep learning techniques can extend and improve traditonal techniques for numerical simulations. The second method targets the complex behavior of liquid simulations. It employs 5D optial flow solves to robustly register the potentially very different space-time surfaces of liquid simulations. This registration can afterwards be used to smoothly interpolate between different simulations without loosing too much detail. The talk also discusses how this approach can be extended by deep learning: we use a convolutional neural network to generate a second deformation to take into account the full behavior of the liquid space region under consideration. The trained network is fast enough to be executed interactively on a regular mobile phone. Once the space-time surface is deformed with the OF and network deformations, it can be rendered from arbitrary viewpoints very efficiently. Below you can find the full abstracts of all three papers, and links to the corresponding pages. We present a novel deep learning algorithm to synthesize high resolution flow simulations with reusable repositories of space-time flow data. In our work, we employ a descriptor learning approach to encode the similarity between fluid regions with differences in resolution and numerical viscosity. We use convolutional neural networks to generate the descriptors from fluid data such as smoke density and flow velocity. At the same time, we present a deformation limiting patch advection method which allows us to robustly track deformable fluid regions. With the help of this patch advection, we generate stable space-time data sets from detailed fluids for our repositories. We can then use our learned descriptors to quickly localize a suitable data set when running a new simulation. This makes our approach very efficient, and resolution independent. We will demonstrate with several examples that our method yields volumes with very high effective resolutions, and non-dissipative small scale details that naturally integrate into the motions of the underlying flow. The new version of mantaflow is online! 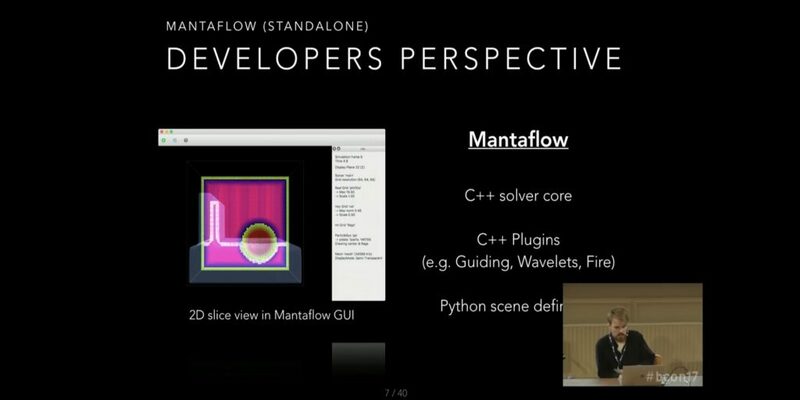 mantaflow is our open-source framework targeted at fluid simulation research in Computer Graphics. We’re especially working on making mantaflow a convenient platform for fluids and deep learning. The new release contains a first set of tools and examples to get started. We will post more in-depths tutorials here in the coming weeks. You can download mantaflow v0.11 here. Or check out the bitbucket git repository. In addition, the new release supports surface tension forces, e.g., for simulating small droplets, and a viscosity solve for thicker materials and physically more accurate simulations. The fast multigrid solver is another highlight. It allows for efficient calculations of large-scale effects. Fig. 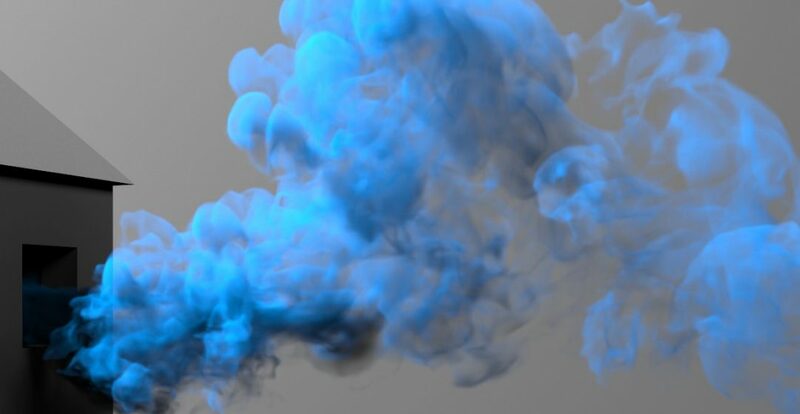 1: A few images of a controlled smoke simulation using the PD-guiding feature of mantaflow. We just added two new publications. One of them focuses on robust decompositions of fluid flows into vortex filaments, and it will be presented at SCA 2017 in Los Angeles soon. You can find all detail on the accompanying page, and you can see a preview below. The other work targets generative neural networks (full details here). In this case the network actually generates a dense space-time deformation field to capture spaces of liquid behavior. We have also created a proof-of-concept Android app (Lukas Prandtl was the main driving force behind this one), which you can download to try it out yourself. The app evaluates the full trained neural network every time you tap to synthesize the corresponding deformation field. This is especially tough in our setting, as the network employs 4D deconvolution layers that need to be evaluated on the mobile device. Our SIGGRAPH 2017 papers are online now. They target covolutional neural networks for detailed smoke, perceptual evaluations, neural network splashes, and robust cutting of deformable objects. Please be aware that we’re still adding the content of the website, so it will increase over the course of the next weeks.